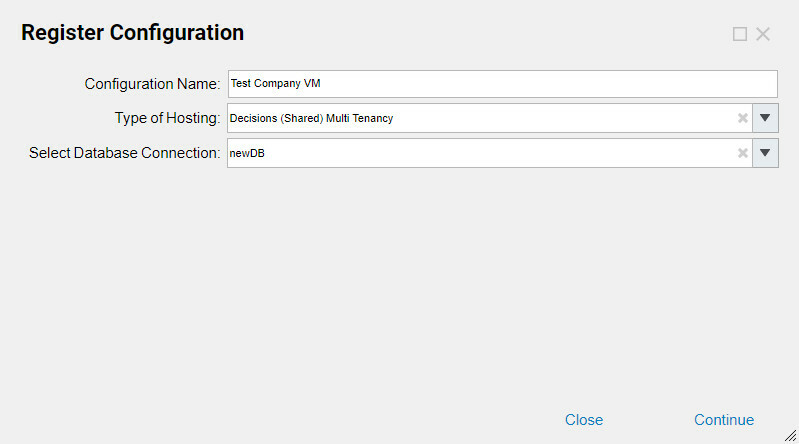 This document shows how to create a Hosting Definition	for your multi-tenant environment. Before a Hosting Definition can be created first set up a multi-tenant environment and register a customer. Please see the links at the bottom of the document if these are not set up. Add a Database:	First Copy the Connection String	that will be used in the new Database. To copy the Database Connection String, start by navigatinging to Systems> Integrations>Databases	and select Local Connection. On the right side of the Folder, view all of the connection data (Figure 3). Locate "Connection String"	and copy the bolded string following the labe. 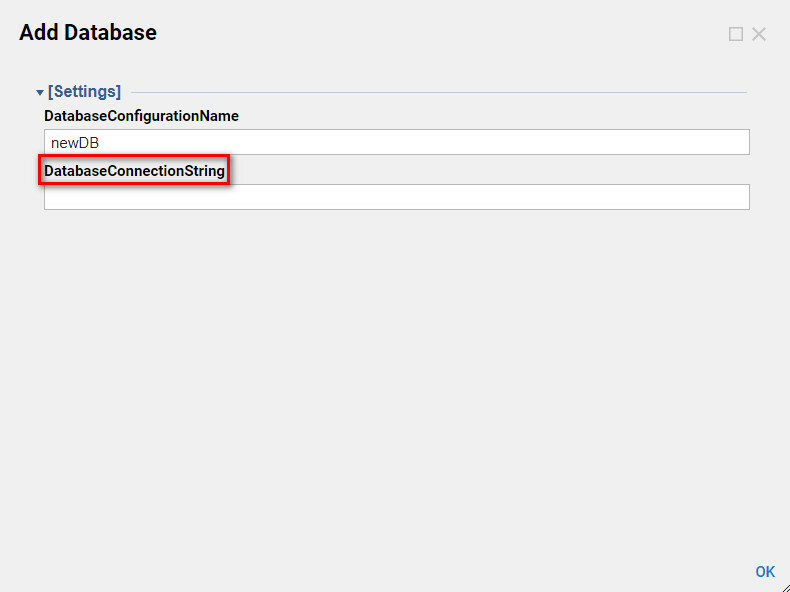 Copy and paste the connection string in the new Database settings displayed in. Next, navigate to the Databases folder under Hosting> Customers> Databases	in the designer Folders. 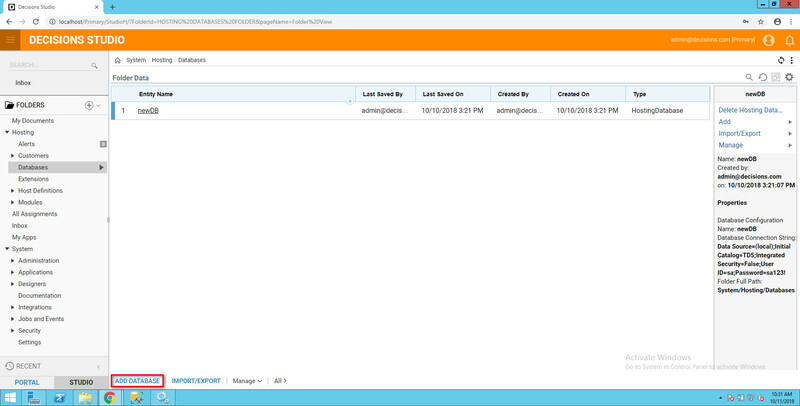 SelectAdd Database	from the blue action panel located at the bottom of the Folder view. Copy the Connection String	for the local database connection and Paste the Connection String	in theDatabase Connection String	field. Select OK	to save and continue. Now that the Database configuration has been set, its time to Add the configuration to the Registered Customer. Locate the Customers folder under Hosting and right click on the Registered Customer. 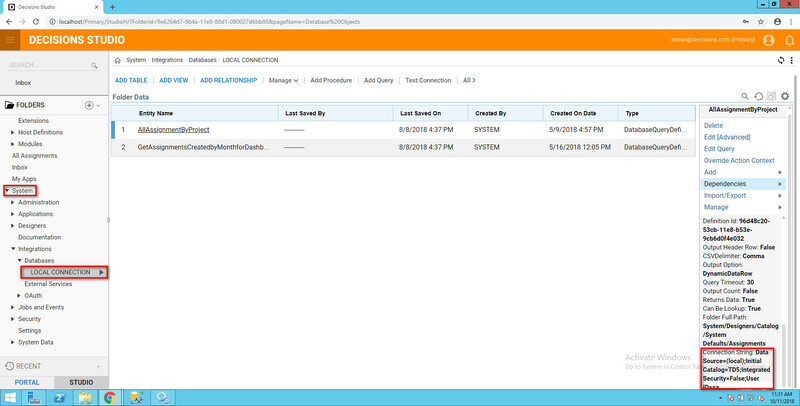 The image below shows Test Company located under Customers, right click on Test Company and select Add Configuration. Set the Configuration name	, choose the Hosting Type	and Select the Database Connection	(Figure 5). Select continue to save the database connection to your Registered Custome. Configuration Name:	The Configuration name can be any given name. Type Hosting	: Choose the Hosting environment, in this case, choose (Decisions (shared) Multi-Tenancy. Select Database Connection:	Here select the newly created Database. This step completes the set up of a newHosting Definition. The Hosting Definition	is now registered to the customer**(Test Company)**	. Next set up a Prototype Instance	in Decisions.